Andrea Hairston and Pan Morigan. 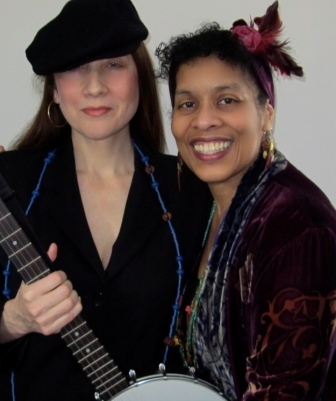 The New York Review of Science Fiction Readings presents Pan Morigan and Andrea Hairston reading and playing music from Will Do Magic for Small Change on Tuesday, May 3. Cinnamon Jones dreams of stepping on stage and acting her heart out like her famous grandparents, Redwood and Wildfire. But at 5’10” and 180 pounds, she’s theatrically challenged. Her family life is a tangle of mystery and deadly secrets, and nobody is telling Cinnamon the whole truth. Before her older brother died, he gave Cinnamon The Chronicles of the Great Wanderer, a tale of a Dahomean warrior woman and an alien from another dimension who perform in Paris and at the 1893 Chicago World’s Fair. The Chronicles may be magic or alien science, but the story is definitely connected to Cinnamon’s family secrets. When an act of violence wounds her family, Cinnamon and her theatre squad determine to solve the mysteries and bring her worlds together. Pan Morigan is a vocalist, instrumentalist, songwriter, poet, and the music/sound director for Chrysalis Theater. Her musical adventures have included creating music and song for upwards of twenty-five plays, touring with Bobby McFerrin and his all-improvisational vocal group Voicestra, producing several albums, such as Castles of Gold and Wild Blue and creating, recording, and performing songs for Andrea Hairston’s novels, Redwood and Wildfire and Will Do Magic For Small Change. Pan’s forthcoming album project is called Storm Hands. Andrea Hairston is the author of Redwood and Wildfire, winner of the 2011 Tiptree and Carl Brandon Awards, and Mindscape, winner of the Carl Brandon Award. Lonely Stardust, a collection of essays and plays, was published in 2014. Her latest play, Thunderbird at the Next World Theatre, appears in Geek Theater published by Underwords Press. Her third novel, Will Do Magic For Small Change, will be published in June 2016. In her spare time Andrea is the Louise Wolff Kahn 1931 Professor of Theatre and Africana Studies at Smith College and the Artistic Director of Chrysalis Theatre. Tuesday, May 3rd — doors open 6:30 p.m. Whenever Pan & Andrea come to honor us with a reading, it’s a special occasion, and this will be no different! Andrea Hairston is author of Redwood and Wildfire, winner of the 2011 Tiptree and Carl Brandon Awards, and Mindscape, winner of the Carl Brandon Award. Lonely Stardust, a collection of essays and plays, was published in 2014. Her latest play, Thunderbird at the Next World Theatre, appears in Geek Theater published by Underwords Press. Her third novel, Will Do Magic For Small Change, will be published in June 2016. In her spare time Andrea is the Louise Wolff Kahn 1931 Professor of Theatre and Africana Studies at Smith College and the Artistic Director of Chrysalis Theatre. She bikes at night year round, meeting bears, multi-legged creatures of light and breath, and the occasional shooting star. The New York Review of Science Fiction Reading Series provides performances from some of the best writers in science fiction, fantasy, speculative fiction, etc. The series usually takes place the first Tuesday of every month, but maintains flexibility in time and space, so be sure to stay in touch through the mailing list, the Web, and Facebook . As always, the Cafe will see to your wining, dining and other worldly needs; and the Jenna freebie table will offer books and goodies, as will the raffle for any who donate. Jim Freund is Producer and Executive Curator of The New York Review of Science Fiction Readings. He has been involved in producing radio programs of and about literary sf/f since 1967. His long-running live radio program, Hour of the Wolf, broadcasts and streams every Wednesday night/Thursday morning from 1:30-3:00 AM. Programs are available by stream for two months after broadcast. (Check http://hourwolf.com, or join the Hour of the Wolf group on Facebook for details.) In addition, Jim is Podcast Host and Post-Production Editor for the twice-consecutive Hugo Award-winning Lightspeed Magazine. The New York Review of Science Fiction magazine is celebrating its 26th year! Subscribe or submit articles to the magazine! This entry was posted in Like Show Business and tagged Andrea Hairston, NYRSF, Pan Morigan by Mike Glyer. Bookmark the permalink.